Basically it is a major part of your digital marketing strategy to drive traffic to your website and should be considered a part of your Search Engine Optimization (SEO) strategy. Simply, if you put a question into Google, it will often put a featured snippet at the top of the results. These are mainly Who, What, Why, When and How queries which Google has become more adept at answering directly in recent times. If you have optimized and succeeded in obtaining a featured snippet, then your result will leap frog everyone else and likely to increase website traffic by 25-30%. What does a featured snippet look like? 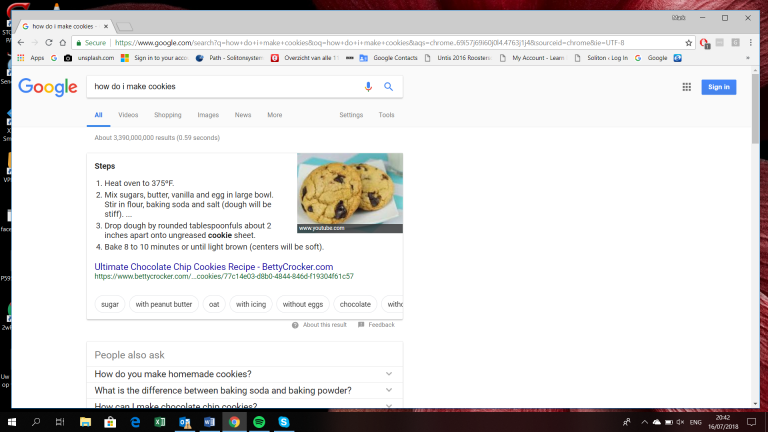 For example try “how do I make cookies?” The result, if it features a snippet, comes above any organic listing. So you need to consider it as part of your SEO strategy especially given featured snippets are probably showing up twice as much as they did two years ago. Having number one in a google search results is no longer enough. 71% (reference claim HubSpot) of queries from a voice activated search will result in a featured snippet. Search is evolving – desktop, mobile and voice search. There are 3 types of featured snippets: paragraph, list and table. To be selected you must already have the website on the first page of the organic results, and to massively increase your chances of being selected, you should be in the top 5. So traditional SEO needs to be the basis of any featured snippet strategy otherwise you are wasting your time. The optimal length of a featured snippet paragraph is roughly 40 to 50 words, or around 300 characters. For table snippets, it is best not to have more than 3 columns and 8 rows. For list snippets, it is recommended that you do not have more than 8 items in the list, though it is claimed that google will display “more items” if the list is longer than 8 items which may lead to a better engagement, but my recommendation is to keep it under 8. For formatting and content, it is obvious best practice to be simple and concise. The snippet must have headers – 7 is maximum as google cuts off after 8. For your own optimization, it is a good idea to take note of what the snippet is serving now and improve on it. Snippets are always being reassessed by Google using their evolving algorithmic process – so you need to check every 4 weeks and improve where possible. About Rain Dance Software Services – Raindance can create content as part of your digital marketing strategy for online lead generation. With specific expertise on technology, IT, video surveillance and broadcast companies, we can help you write content that includes the basics of achieving featured snippets.